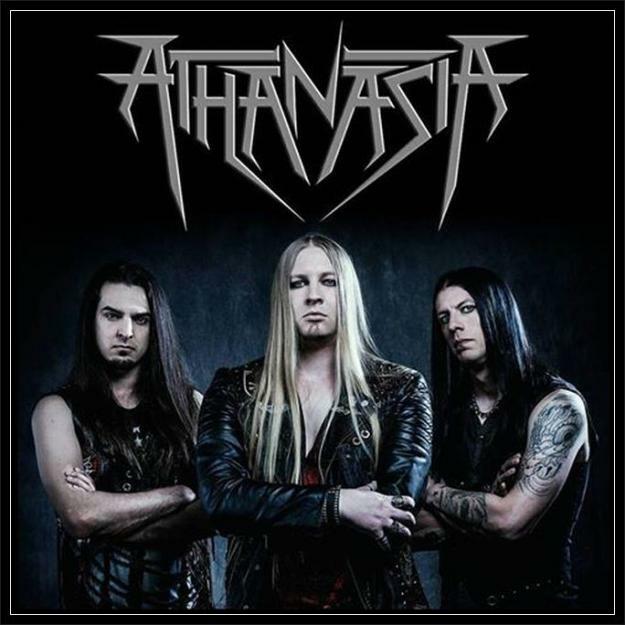 Athanasia, a new band that recently released 3 amazing videoclips and toured Europe with Nightmare (Fr) and Civil War. We really loved the clips and enjoyed the live gig, honestly we are looking very forward to the band's debut album. In the meantime, we decided to send some questions over to the man who formed this band, Caleb Bingham (vox/ guitar). Hey Caleb, how are you doing? You recently came back from a European tour with Civil War and Nightmare! How was it? Hey Nico! I'm doing really well man. We did indeed and the tour was great! To be honest I had no idea what to expect as it was not only Athanasia's first time playing in Europe but also our first time playing live in general... Haha! It went over really well though. We were very well received every night and played to mostly packed venues. I think it was a good sign that despite being the opening act we had a large number of people showing up early in the night just to watch us. We had a ton of people coming up to us after the gig wanting to meet us and find out more about the band as well. We actually drew better than the headliner did in France and a few people there were already familiar enough with the songs we have already released off of the album to be able to sing along to all of the lyrics... I really wasn't expecting that and was pleasantly surprised! We sold 90% of our merchandise by gig three as well. All in all it definitely wasn't a bad start for us out on the road at all! Wasn't it a bit risky to go out on a tour without even having an album out? Risky? I don't think so. There have been plenty of instances throughout history of bands going out and playing their material live before putting out the record... It builds hype!! Let's go back into time, if my research is correct you first started a project back in 2004 under the name Ascension? But that got put on hold when you joined 5FDP, which you left in 2007, what happened after that? I did yes! I was still in high school at that point. My first demos I recorded in my mom's garage as Ascension in 2004 ended up in the hands of Zoltan Bathory who was forming 5FDP just as I was graduating from school in 2005... That led to him calling me for an audition and me ultimately joining the band during their early days. I ended up getting replaced when I was 19 due to being substantially younger than the rest of the guys in that band though. Afterwards I continued to write and record my own stuff and also began to work a lot in the studio producing and engineering for other people. In 2010 I joined the Swedish death metal band Zonaria. I played with them until I broke my leg in a freak accident over there and had to move back to the US in 2014. Was that the start for Athanasia? Was it easy finding members to complete the line-up? At first my plan was to continue as Ascension, but after a couple of false starts I ended up deciding to scrap that band and start up something fresh under a new name. Brandon and I spent a few months looking around for a drummer and ended up trying out a couple, but Jason really stood out from the rest and we got along really well right away. After just a couple of rehearsals with him, we knew right away we had something good going and started up Athanasia from there! Can you tell us anything about the bandname Athanasia? Who or what is the Order of the Silver Compass? So far you have released 3 video clips, which show that Athanasia is a diverse band, lots of different influences! Which doesn't make it easy to categorize you guys! Yes indeed and I agree! To be honest I really adamantly hate how heavy metal these days has been sectioned off into all of these various cookie cutter sounding sub-genres in which it is exceedingly difficult to tell one band from the next. It's really quite boring and isn't at all entertaining to me as a listener. I think Trey Parker and Matt Stone (the writers of South Park) have accurately summed up the mentality of most metal fans these days well with their bit about the "non-conformist" goth kids who said "if you want to be one of us, all you have to do to is dress just like us and listen to the same music we do." It's really true! Hahaha! So what's next in the agenda for you guys? Are you eager to go out on the road again?